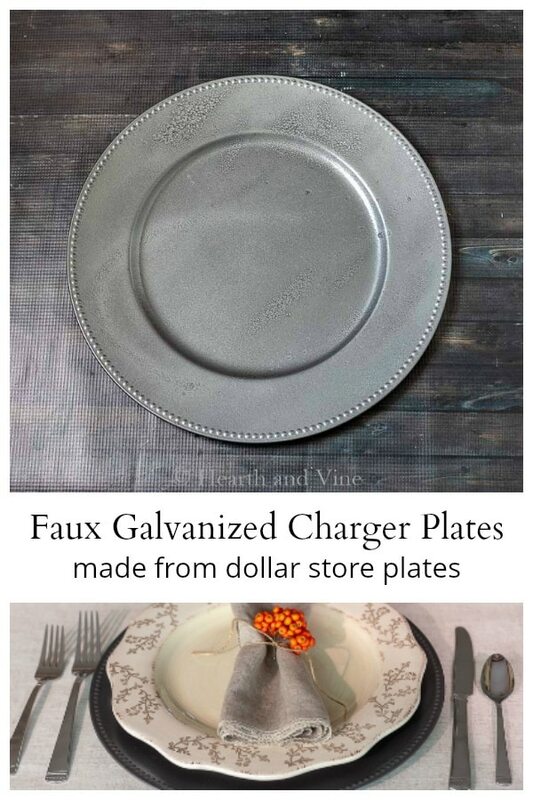 Simple plates from the dollar store can easily be turned into faux galvanized charger plates to adorn your table all year long. This is another simple craft that I have seen done before. However, often even if a project seems overdone to me, I find that when I talk with my family and friends, so many of them have never heard of the idea. So when I was looking for some galvanized charger plates for my dining room and realized how expensive they were, I decided to go the DIY route. This is a plastic charger plate from the dollar store. Since I needed eight, paying one dollar seemed much better than five or ten dollars a piece for the real thing. However, the gold was the only color they had and it looked a little cheap. What do you expect for one dollar? How could I make them look better? Paint! Start by scuffing up the plate all over with sandpaper. Then give it a couple of coats of paint. I chose this hammered gray spray paint to give them a galvanized metal look. One can of this spray paint easily covered all eight plates. I really liked the way the hammered spray paint gives a nice texture to different areas of the plate. You may want to buy an extra plate. That way you can experiment a little to get the texture you like. It works perfect with my rustic plates and I feel like it can be used, not just in fall, but all year long. Then all I needed to do to decorate for fall was add a little color. These bright orange pyracantha berries did the trick. Love it, Patti… not much new under the sun, but we can always put our own twist on it. The other day, I was talking with another (way more experienced than me) blogger, and she said she had NEVER seen the counters done with adhesive film. She was actually amazed! LOL! 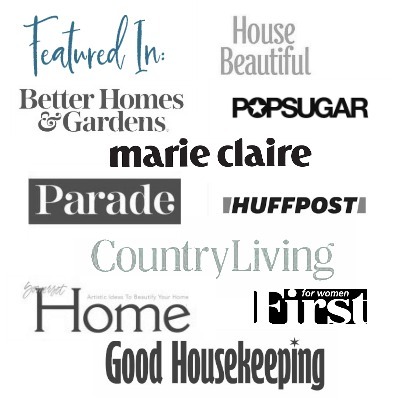 😉 So, like you said, there are lots of people who haven’t seen the diys we do. Yay! Isn’t it amazing what a can of paint can do, Patti?! I did this last year only made mine copper colored! I love the galvanized look you chose! And I agree you could definitely use these chargers year round! Thanks CD. I’m just amazed at all the fun textures and looks you can get from spray paint these days. Oh and copper would be soooo pretty. Very nice idea and extremely pretty! Thanks for the idea! So easy – but it just didn’t even dawn on me! It is really simple Nina. Thanks for letting me know that you liked it. Thank you, Patti, I’ve learned something new. I really enjoyed your stuffed owl tutorial too. I have set the dining room table since I was a young girl setting my Grandmother’s table for our family Thanksgiving. I was taught to turn the knife blade so it faces in toward the plate. That’s the way I’ve always done place settings. Thank you for a great blog. Thanks Claudia. So glad you like the blog. I can never remember the placement for the knife so thanks for the reminder.